Taken from the collection of the curator Piet de Jong this survey of one hundred of the multiples released by the conceptual artist Lawrence Weiner will be exhibited for the first time at Summerhall before touring elsewhere. 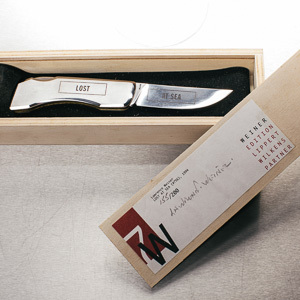 Lawrence Weiner is arguably the most influential artist to come out of the conceptual art movement of the 1960s. His “Declaration of Intent” of 1968 defined for many the credo of conceptualism – in that “Declaration” Weiner explained for the following generations of artists that a work did not need to be physically made, it was simply enough for the work to be conceived to establish it as a work of art. Weiner’s multiples have been an essential aspect of the artist’s practice since 1969. They on one level may be seen as an act of democratising art and making works affordable but also can be seen as a method of distributing Weiner’s ideas about art by the addition of texts (“Statements”) to everyday objects. Posters, badges, bags, cups, t-shirts, pens, cutlery, vases, writing desks and tables are all items by which the artist’s “Statements” may be mediated – yet the choice of object is often crucial to the interpretation of the work. And many are surprisingly beautiful – a term not often associated with conceptual art!